Getting married during the Christmas season will be beautiful and magical. People have a tendency to be more spiritual and jolly thus having an air of fellowship. 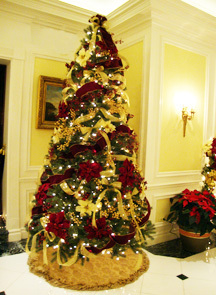 Keep in mind that the Christmas season is a hectic time of year for you, and your guests. So early planning is a must. I would not recommend having your nuptials take place on Christmas Day or a day or two immediately before or after Christmas. Remember, even if your friends are not Christian, most people have family obligations and it would be sad if your guests had to choose between going to your wedding or going to visit a family member. If your budget permits, send "save a date cards" as soon as possible. If that is a cost that you would rather avoid, send e-mails to everyone in your address book. Or mail your invites in mid September, however, the standard time for mailing invites is 6 - 8 weeks before your nuptials. 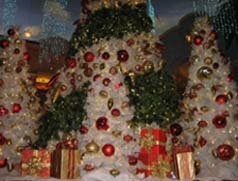 Most churches and catering halls are fully decorated for the holiday season so you will be able to save on those costs. Notice the beautifully decorated vestibule (above) and hallway (below). Flowers have a tendency to be more expensive during the holiday season. Consider using a few flowers surrounded by sprigs of holly, or other winter greenery for your attendant’s bouquets. 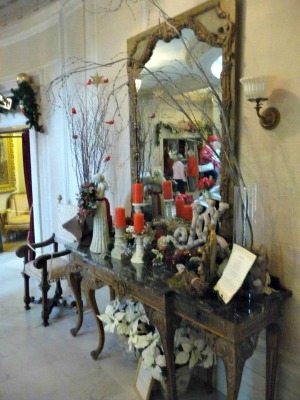 Placing your centerpieces on a mirror doily with a pillar candle and pine branches is a romantic, elegant look. An inexpensive centerpiece idea would be to purchase poinsettias and surround the base of the plant with white pine, hemlock branches or snow glitter. If you become engaged a year ahead of your marriage, go to the craft stores in your area when they are having the after Christmas sales and purchase small wreaths or Christmas ornaments. Put them away and give them as favors, which will also double as additional table decorations. Ask a friend to dress as Santa or hire a Santa to make an appearance during your reception. Your young guests will be delighted and it is a great picture opportunity for all. The centerpiece below is easy to create. 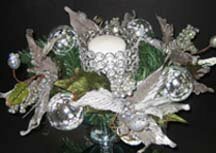 Purchase a clear candle holder and place a tea candle in the center and then surround the vase with a silver wreath and green holly leaves. Think out of the box and use my Christmas wedding ideas to create the magical, romantic day of your dreams. Find additional tips and advice on our Welcome page.